On International Women’s Day we think of the almost 400 women who are currently detained in Scottish prisons. News released today by SPS shows images of a new smaller prison for women to be opened in 2020. Scotland has a history of trying to be innovative in regards to women’s imprisonment. Yet the failure of these innovations is also an inescapable part of Scotland’s contemporary prison history, as self-harm and suicide have continued inside the prison, and women’s poverty and social exclusion continue to be entrenched by having been imprisoned. And despite efforts, over the last 40 years we have witnessed the steadily increasing number of women imprisoned in Scotland. But there are lessons in failure that can help us re-think the future of women's penal policy so that it can meet the demands of social justice. We welcome that the new prison will hold around 20 women. HLS firmly believe that the social and rehabilitative value of small prisons far outstrips the expedient value of economies of scale of larger prisons. But real penal reform and innovation will not be found in a small scale expansion of the women’s prison estate, but through decarceration. We hope that this new prison is a development in that direction. Scottish government should formally commit to reducing the size of the women’s prison population to at least half of what it currently is. With public and political backing, Scotland can take this opportunity to be a world leader in social justice and penal reform by radically cutting the number of females in custody. However, if we do reduce the prison infrastructure to hold less than 200 women and girls (which would be half the current number), how can the government guarantee against overcrowding? While the recent plans in the Management of Offenders (Scotland) Bill make provisions to extend electronic monitoring which can alleviate prisoner numbers, as HLS recently wrote, this brings with it other risks to citizenship and community life. We should not lose sight that social justice is not only about imprisoning better, but imprisoning less. The Scottish Government has just released their annual Court Proceedings statistics. As a result, what we have learned is that the number of people being convicted has fallen. This is welcome news, meaning that fewer people in Scotland become entangled in the criminal justice system. These changing conviction rates are in line with a general fall in crime that has been experienced here and elsewhere, the reports highlight that crime in Scotland is now at a 43 year low. 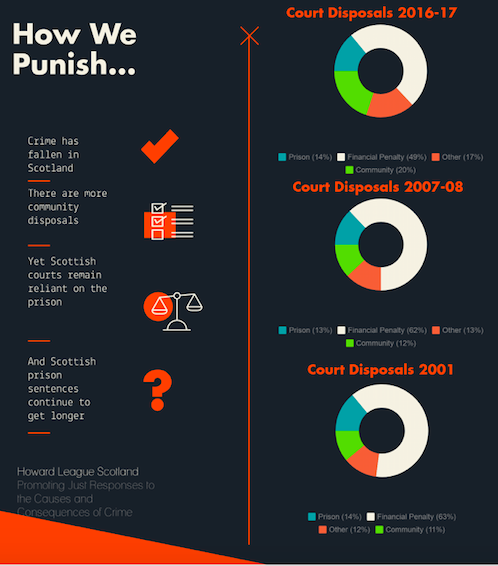 While the Cabinet Secretary for Justice, Michael Matheson, welcomed these findings, this data revealed patterns of punishment that HLS remains seriously concerned about. The average sentence length has risen to just over ten months, a 26% increase over the last decade. 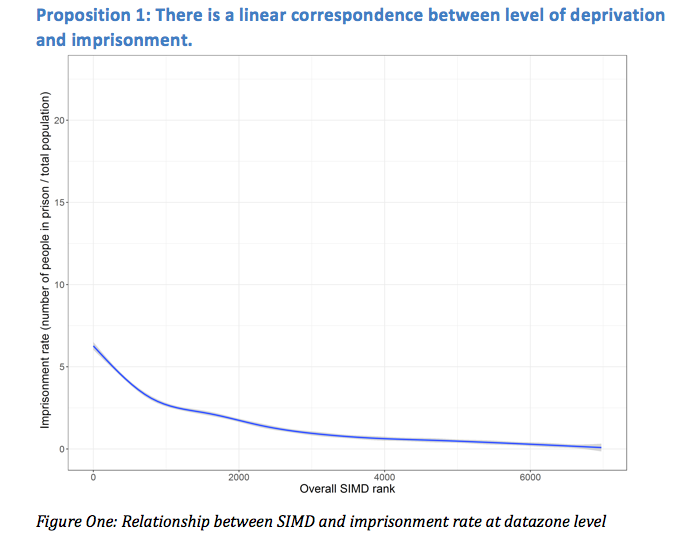 This figure may also be artificially deflated because it excludes life imprisonment and indeterminate sentences, which are the longest prison sentences. Therefore, while the number of people being convicted has fallen, ever increasing sentence lengths means the average daily prison population has continued to be consistently high. 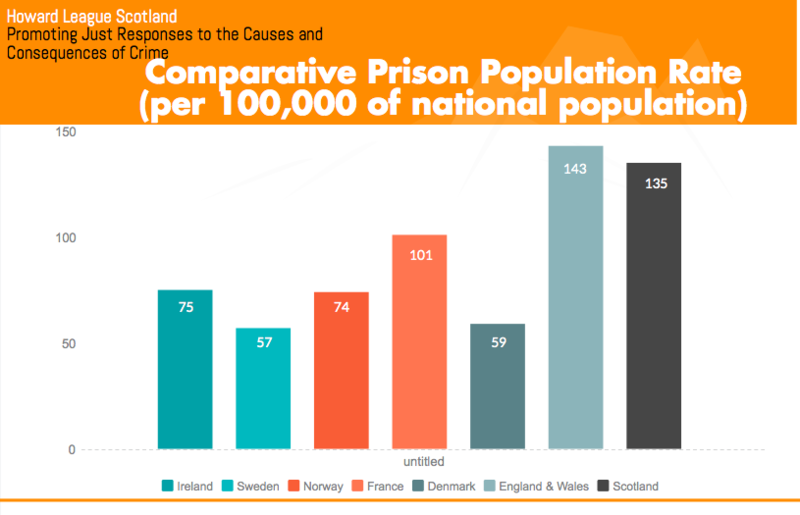 With an average 135 people per 100,000 being incarcerated, Scotland has one of the most extensive prison systems in Western Europe. Any advances, whilst encouraging, remain overshadowed by the pervasiveness of the Scottish prison. 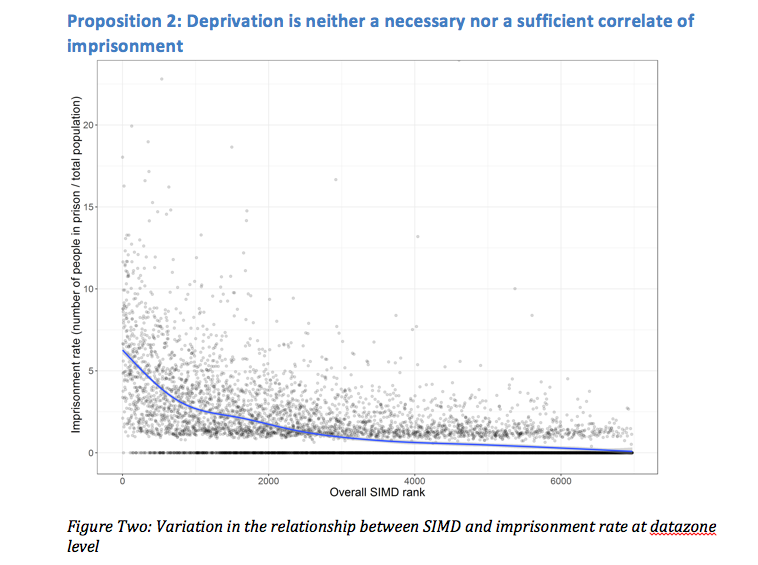 The good news is further complicated by examining changing sentencing patterns for all disposals across the last ten years. Increasingly, the courts are imposing community sanctions. It appears, however, to be at the expense of the fine, as the use of the prison has stayed the same, with between 13-15% of all of those sentenced over the last decade receiving a term of imprisonment. 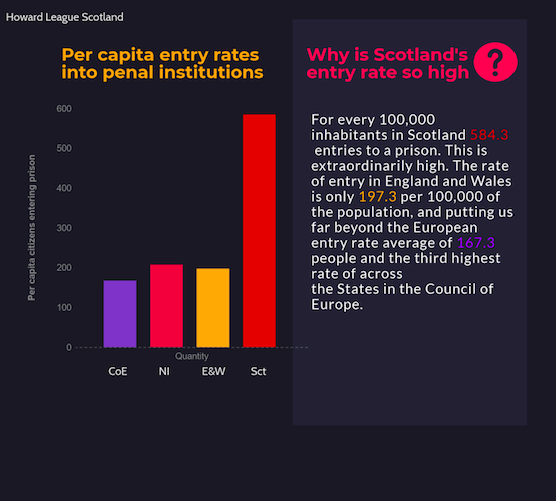 Despite significant and important changes in court disposals and crime rates, the prison remains an enduring and steadfast feature of the Scottish penal landscape. A large part of the motivation behind developing alternatives to custody, such as community disposals, was informed by a recognition that the ‘prison may sometimes do good, but it always does harm’ (Scottish Prisons Commission, 2008). But community sanctions are more intrusive than fines, they are certainly not a soft option. If they are in fact displacing the financial penalties rather than the prison, this should be seen as a potentially serious development. HLS strongly advocates for a reduction in the frequency and the severity of custodial sentences: less people should be imprisoned and sentence lengths should be curtailed. We need to address what appears to be a worrying pattern emerging in Scotland of longer prison sentences being handed down by the judiciary for all crimes. Our vision is for a Scottish sentencing system that reflects the values of social justice in which the prison is used parsimoniously. With crime at an all time low, this should be seen as an opportune moment to reverse Scotland's persistently and troublingly high use of incarceration. The annual Drummond Hunter Lecture was a great success this year, with over 200 people in attendance to hear Lord Carloway discuss The Purpose of Sentencing – From Beccaria to the OLR and Beyond’.